An image sensor coated with QuantumFilm efficiently captures light and sends the digital signals to the silicon underneath. Image credit: InVisage. 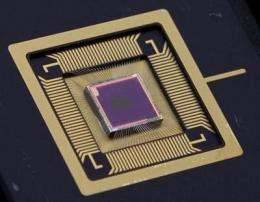 (PhysOrg.com) -- As it's becoming more and more difficult for silicon alone to improve the sensors used in today's digital cameras, a new material may be emerging from physics labs to provide a large performance boost for digital cameras. QuantumFilm, which is made of quantum dots, could offer four times better performance and twice the dynamic range of existing silicon sensors, claim its developers at Menlo, Calif.-based start-up company InVisage. The main advantage of using quantum dots is that, compared to silicon, these tiny semiconductors are much more light-sensitive, meaning they can turn more of the incoming light into an electric charge than silicon sensors. While silicon-based image sensors today capture about 25% of incoming light, silicon sensors coated with QuantumFilm can capture 90-95% of the light, enabling better quality pictures, especially in difficult lighting conditions. According to InVisage, quantum-dot-based camera sensors can achieve the same performance as today’s digital cameras in a much smaller size. This advantage should be particularly beneficial for high-end mobile phones, giving them the ability to capture stunning images with a quality comparable to today’s digital cameras. As InVisage President and CEO Jess Lee explained, QuantumFilm could transform the current three-megapixel camera found in the Apple iPhone into a 12-megapixel camera that works better in varying light conditions. He also said that the quantum-dot-based sensors would not be more expensive than current sensors. Overall, the problem with silicon-based sensors is two-fold: not only does silicon turn only half of the incident light into electric charge, but metal circuits also block part of the light, reducing the overall efficiency to 25%. "It is becoming increasingly difficult and expensive to develop next-generation image sensors using silicon; essentially, silicon has hit a wall," said Lee. "The fundamental problem is that silicon cannot capture light efficiently, but until now it has been the only option." InVisage’s solution to these problems - QuantumFilm - was developed by InVisage CTO Ted Sargent, who is also a professor at the University of Toronto. Sargent showed that, by adding a coat of QuantumFilm to the silicon, he could create sensors that can achieve three times’ greater efficiency than silicon alone. In addition, the design enables the metal circuits to be placed underneath the quantum film, where they don’t block any light. Although quantum dots are commercially produced by other manufacturers, they have never been used for image sensors before. More typical applications include solar cells, displays, and identification markers. InVisage says it will have samples ready for phone manufacturers by the end of the year and the sensors could be in mobile phones by mid next-year. Other applications could include automotive and security cameras, as well as military applications. The technology should be easily integrated into existing semiconductor manufacturing methods. QuantumFilm will be demonstrated for the first time this week at DEMO Spring 2010 in Palm Desert, Calif., and at Image Sensors Europe 2010 in London. Wow, that's quite a breakthrough! Mind you, even with better chips catching the light, cameras on phones will still be limited by the poor quality (and tiny) lenses that they sport. But even so, this is still a big deal. hopefully it will scale and have major benefits in larger cameras as well. Can you imagine a Hubble class telescope with this upgrade? Do you think the James Webb guys would consider postponing and upgrading before launch? I don't know but I sure hope so, also it shouldn't be that hard of a change. So they just might. Anyone that wants them too should forward them this article. "Do you think the James Webb guys would consider postponing and upgrading before launch?" Digital Technology sent to space is years behind what is available on the ground. There are many reasons for this. One important reason is that digital technology must be carefully modified (hardened) to withstand the myriad dangers of space. The computers on the most advanced civilian imaging satellite now in space is a PowerMac G3. (I think this is on the HIRise space craft) This tech is a decade old and is just now coming into use in space. The space program requires at least a decade to build a new technology. This startup time (whether politicians know it or not)is the main reason that building human spaceships based on current non-classified technology is almost silly. Almost anything designed today will be laughably obsolete by the time it is finished. This technology could be used for infrared as well. there is a reason optics uses lensing -- its for all practical purposes infintely magnifiable.... you can blow out images till it to blurry to be useful .. and the lenses they are sending up are the best and newest in the business. While i have no opinion on if q 5nm quantum dot can effectively image a 450 um (micrometer) wavelength i have to assume NASA would. If this technology can be used for infrared, it might be an inexpensive route to night vision on the dashboard like the Cadillac was once working on. A nice safety result. remarkably like the eye's retina, wherein the optical sensors are largely blocked by nerves and cooling systems.